Israeli army warplanes on Saturday struck targets in the blockaded Gaza Strip, the army announced. The attack came after Israel announced it will close the Kerem Shalom (Karem Abu Salem) crossing between Israel and the Gaza Strip until further notice. “Due to the destruction of the Kerem Shalom Crossing on the Palestinian side, the Minister of Defense, Mr. Avigdor Liberman, approved the recommendation to close the crossing,” the army said in a statement. 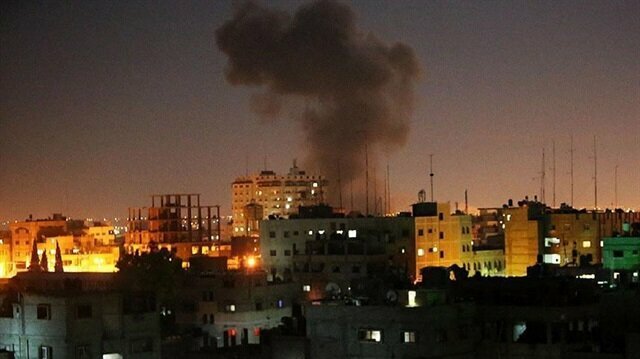 Eyewitnesses, meanwhile, reported that Israeli warplanes targeted an open area of land in the town of Beit Hanoun in the northern Gaza Strip. Palestinian medical sources, for their part, said the Israeli attack did not cause any casualties. Tension has grown across the Palestinian territories since Dec. 6, when U.S. President Donald Trump officially recognized Jerusalem as the capital of Israel. Since border rallies began on March 30, at least 48 Palestinians have been martyred -- and hundreds more injured -- by cross-border Israeli army gunfire, according to the Health Ministry. Hundreds of people rallied in front of Israel’s embassy in London to protest the 70th anniversary of Israel’s establishment -- an event Arabs refer to as “The Nakba” or “The Catastrophe”.Holding Palestinian flags and banners, the protesters were chanting “Free Palestine”, “Freedom Now” and “End Occupation” slogans.Some of the placards held by the protesters read “Stand up For Gaza, Stop the Killing” and “Nakba70, We Are Returning”.A small number of pro-Isareli protesters carrying Israeli flags also held a counter protest near the embassy located in South Kensington.Jewish immigration to Palestine rose considerably during the British mandate period, which lasted from 1922 to May 14, 1948.Ultimately, some 700,000 Palestinians fled their homes -- or were forcibly expelled by invading Jewish forces -- while hundreds of Palestinian villages and cities were razed to the ground.The Palestinian diaspora has since become one of the largest in the world.Until this day, Palestinian refugees remain scattered across Jordan, Lebanon, Syria and other countries, while many have settled in refugee camps in the Palestinian West Bank and Gaza Strip.Last December, U.S. President Donald Trump sparked an international outcry when he unilaterally recognized Jerusalem as Israel's capital and vowed to relocate Washington's embassy to the flashpoint city -- a move scheduled for next Monday (May 14).Tension has mounted on the Gaza Strip’s eastern border with Israel since March 30, when Palestinians began holding open-ended demonstrations to demand the “right of return” to their homes in historical Palestine from which they were driven in 1948.Since the rallies began some six weeks ago, at least 48 Palestinian demonstrators have been martyred and hundreds more -- possibly thousands -- injured.The Nakba will be protested with various activities -- which will take place in the West Bank, the Gaza Strip and in Arab villages inside Israel -- including seminars, marches and protests, according to organizers from the National Committee for the Commemoration of the Nakba.May 15 will also be a day of “confrontation” with the Israeli army “in all border areas,” organizers said. Protesters are demanding the right to return to their homes in historical Palestine, from which they were driven in 1948 to make way for the new state of Israel. The border rallies will culminate on May 15 (next Tuesday), which will mark the 70th anniversary of Israel's establishment -- an event Palestinians refer to as the "Nakba" or "The Catastrophe."